Mired in a brutal economic collapse, Venezuela refuses to publish basic statistics. So Bloomberg created their own gauge to measure one of the most important of all the missing figures - inflation (or hyperinflation in this case). 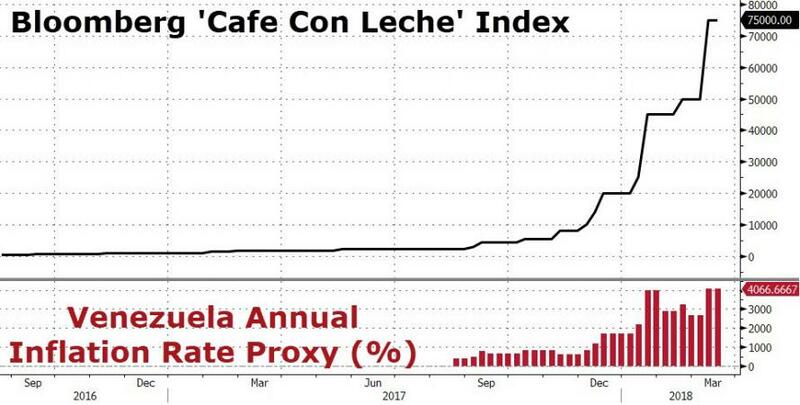 Bloomberg explains that, as the name would suggest, it tracks just one item: a cup of coffee served piping hot at a bakery in eastern Caracas. Its price has jumped to 75,000 bolivars from 1,800 bolivars over the past 12 months, an increase of 4,067%. As we noted previously, the printing press simply cannot save the country from a death spiral, but it doesn’t mean Maduro is prepared to let go of power. He has maintained that Venezuela's problems are due to economic warfare being waged by the United States to topple the oil-rich socialist regime. The shrinking value of the currency has meant that withdrawing the equivalent of $5 from an ATM produces brickloads of bills. Some ATMs now need to be refilled every few hours, because the machines can only hold so much cash. This means there are often a limited number of functioning ATMs in Caracas, and long queues to withdraw money. But the wheelbarrows-full of bills have meant paying for everyday groceries has changed in the socialist utopia. 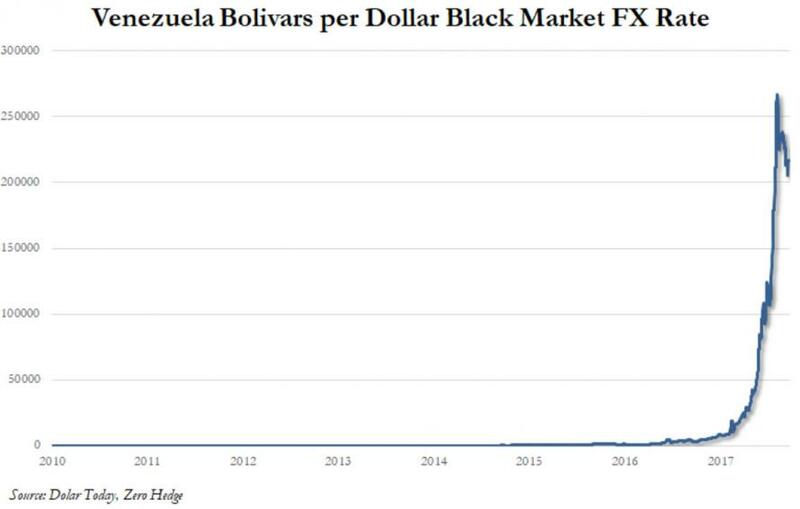 Having thrown in the towel on hyperinflation by printing banknotes with 200-times-higher denominations, we noted previously that things in Venezuela have continued to get worse with the currency now so devalued (with even simple purchases requiring so many bills) that instead of counting bills, they are weighing them. 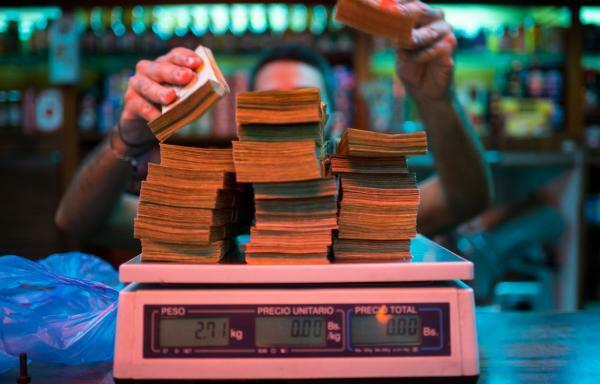 Once one of the world’s strongest currencies, the bolivar has been reduced to a nuisance. Basic purchases require hundreds of bills. Shoppers shove piles of them into gym bags before venturing into crime-plagued streets and shopkeepers stash thousands in boxes and overflowing drawers. “When they start weighing cash, it’s a sign of runaway inflation,” said Jesus Casique, financial director of Capital Market Finance, a consulting firm. But now, as Bloomberg reports this week, even the scales can't cope! The price of a kilogram of ham is just too long. Living in Venezuela, you get used to hearing that, but the story behind the missing ham was different. It’s not that supermarket managers were having trouble finding enough to sell - the typical cause of shortages ravaging the country - they had decided to stop ordering it. The reason: After years of hyperinflation, the price is too long. The store’s deli scales run to only six digits. And ham, my Whatsapp food-hunting community tells me, is retailing nowadays for about 1,480,000 bolivars per kilogram. It didn’t matter that I wanted only a few hundred milligrams. The cost was, at this market at least, incalculable. ...the clerk told me they’re trying to fix the scale so they know how much to charge. They’d better add a whole lot of digits. And, as Bloomberg previously concluded, people like Bremmer Rodrigues, 25, who runs a bakery on Caracas’ outskirts, are at a loss over what to do with their bags of bills. Every day his business takes in hundreds of thousands of bolivars, which he hides around his office until packing them up in boxes to deposit at the bank. He says if someone looked in on him, he might be mistaken for a drug dealer..